It’s been almost a month since I wrote a blog post, I can’t quite believe it! I’ve turned into one of those people who gives up after 6 months, though to be fair, I have had good reasons. I recently started a new job as a trainee Accountant at KPMG, so I won’t be cooking quite so much as I used to. Well, except for easy freezer meals or roasted veg, but those aren’t exactly things I’ll write often about. Except for the veg. I have, however, managed to cook my first ever roast by myself. The first roast I ever cooked was the epic Riley family Xmas dinner of 2010, which I cooked with my sister, but this was on my own and on a smaller scale. 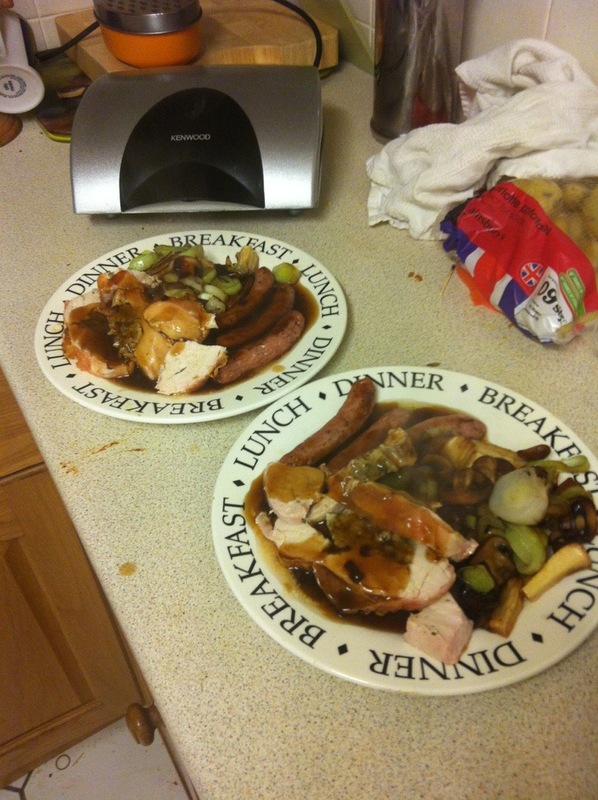 I was cooking for myself and my housemate Will, and it’s Turkey with roasted peppers, tomatoes, parsnips, leeks and sausages. It was pretty epic. I repeated the same thing a week later with gammon, which is my favourite meat. I’m going to try and do one a week, cooking is so relaxing! Roasts are awesome! My favourites have to be roast lamb or chicken. YUM!